After egregiously skipping over many anime film and TV releases for 2017, I did at least felt like I owed it to myself to jam pack 2018 trying to unearth the best of the best from the past year. With so many great choices too numerous to name, Napping Princess immediately caught my eye. Whether it be the astonishing box key art, outlandish premise, or even Kenji Kamiyama (of Ghost in the Shell and Eden of the East directing fame) leading the charge, I could tell this probably would make for an unforgettable experience. Needless to say, that assumption definitely holds true and glad that I finally decided to give it a go. The story takes place in Japan 2020, 3 days before the Tokyo Summer Olympics. High school student Kokone Morikawa, a headstrong, yet free-spirited girl lives a normal life with her single auto mechanic father as her mother passed away years ago. After a deluge of events, her father is soon placed under arrest for allegedly stealing plans from the automobile giant Shijima Motors, and now up to Kokone to prove his innocence. However, the solution to this might lie in Heartland, a magical dream realm she can visit only by sleeping. 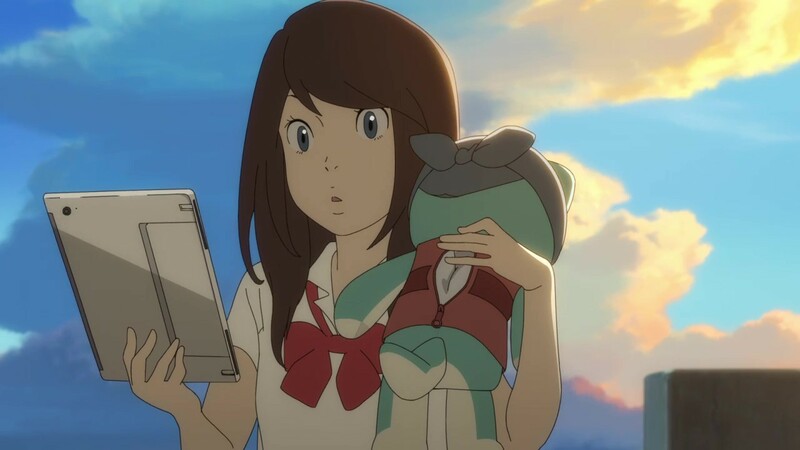 Filled with a fair amount of intrigue, suspense, and adventure, Napping Princess is a film that never relents in letting the audience catch its breath to digest what is truly happening behind the scenes, yet all the better as it isn’t too difficult to figure out. With most of the action and story beats happening equally between the real world and Heartland, as a plot device, Heartland has to be the most interesting. Besides being apart of a bedtime tale from Kokone’s past, it not only aids in avoiding the sin of expository info-dumping but also acts as a nice force that keeps propelling the story forward. Then again, with a 1-hour run-time and devoid of any subplots, the pacing really speaks for itself as a good example of how to do right by the action-adventure genre. Even though Heartland leads to some rather baffling parts in the film that never gets fully explained (including one major story point), this is easily forgivable with what it does share compared to many titles that don’t bother to meet the audience halfway. And while the second act of the film dials the creativity (or madness) to 11 with an over-the-top and feverish climax, after pouring through the film a second time, it does make perfect sense. Being a family friendly movie, the overall theme of fear and change might not have much impact or make sense to younger viewers, however, should not dissuade anyone – no matter the age from watching. As far as characters go, I enjoyed the entire cast. Kokone fits nicely as the typical female lead that I tend to gravitate toward: spunky, straightforward, yet earnest where it counts. I even liked the goofy villain, a guy so campy he belongs in a Disney movie. Don’t believe me, just check out the brilliant photo introduction he is given. In addition to the original Japanese track, the home release does include an English dub, but found nothing significantly lacking or added in the latter. With Signal M.D being a subsidiary of Production I.G, the overall visuals are stunning. Not being as elaborate or crisp as some of Production I.G’s other back catalog offerings, it still holds up nicely. As mavens in the computer graphics department, it’s surprising that the film does not flaunt it much aside from flourishing a few scenes where not much goes on. Slightly chiding the unusual focus on the 2020 Olympics as apart of the setting, after watching the film and seeing the intermingling of old and new, the theme even made more sense. It is all about fighting fear. With 2020 being a milestone year sure to include: changing leadership positions, new opportunities, and even greater uncertainty, fear of the unknown or past fears should not be a roadblock to the future. From Kokone’s father interactions with her to the climax battle with the figure known as “Colossus”, the motif of fear as well as overcoming it is excellently done. Of course, there is more to the message than that. Granted that Napping Princess does not hit all the sweet spots most anime films I have come to enjoy, it still manages to come close enough for me to admire and hard to dismiss or if I dare must say it: a title you do not want to sleep on. Pros: Cool concept, likable characters, quick runtime makes for a nice mix of action and adventure. Cons: The Heartland segments don’t get fully explained, second half of the film hits a minor lull. Final Verdict: A delightful and endearing flim from 2017 is nothing short of amazing. Sometimes a bit complicated due to the breadth of writing, but a short and sweet piece with a nice message. I’ve been dying to see this ahhh your review makes me so excited for when getting to see it. Great post!!! If you’re interested in anotherHirune Himetalk, here’s one! Highly recommend it. You won’t be disappointed. Yeah, it was a crazy end of the year for me. Everything from moving to changing jobs, but should be around a lot more. I technically went to go see Mary and the Witch’s Flower, first, but this was the second film from 2017. I always enjoy finding the lesser known productions or those passed over, so you aren’t the only one. I was planning to view both, especially Kono Sekai no Katasumi, so they aren’t too far behind. Still need to review Girls und Panzer Der Film, which was amazing for the battles alone. Never heard of this movie. Given the other stuff the director has worked on I think I should give this film a try.